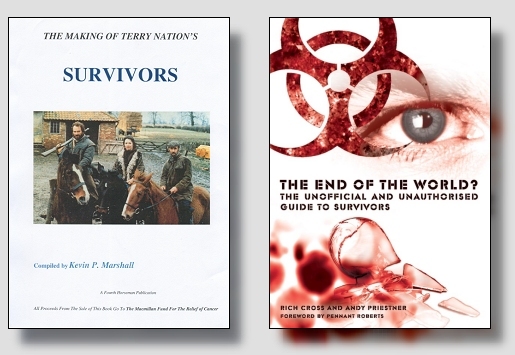 In 1995, Kevin Marshall self-published a 500-copy print run of The Making of Terry Nation’s Survivors — the product of an extensive period of self-funded research. Comprising short introductory guides to each of the show’s three series, the main component of the book was a set of original interviews with the cast and behind-the-scenes creative team. These were supplemented by a series of descriptive reviews of all 38 episodes of Survivors, and a collection of behind-the-scenes photos. Long out-of-print, this title is highly sought after by fans of the series and now changes hands at prices that reflect its collectability. In December 2005, The End of the World? : The Unofficial and Unauthorised Guide to Survivors, written by Rich Cross and Andy Priestner, was published by Telos. Fully-illustrated by dozens or rare and never-before-seen behind-the-scenes photos, the book provides detailed production essays on the making of each of Survivors’ three series; summaries and reviews of all 38 episodes; guides to the programme’s characters and its filming locations; analysis of efforts to revive the programme; discussion of the show’s influence on the post-apocalyptic genre on the big and small screen; and much more besides. The book includes a Foreword by series one and two director Pennant Roberts.